To download this picture as a screen saver simply click the image. Changing the world starts with changing yourself. And let's face it. Changing yourself is the most difficult first step to take. I have this book. It's really more like a journal, but it's the home to my goals for the next year. A lot of the goals are things like pay off debt, lose 20 pounds...you know...they're probably a lot like the goals in your book. But then there are other goals in there that have to do with changing my character and my attitudes. Those goals are a lot more difficult to accomplish than paying off debt and losing 20 pounds. When we look at our life, if we're honest with ourself, we can see the character flaws that need to be changed. They're those blinding defects in our lives that haunt us. But changing those glaring flaws are real challenges. So how do we change them. If we are to be real world changers we have to change! We can't stay the same! Sure, we can throw money at problems. We can donate our time to a cause that is important to us, but in reality, real lasting change will only begin when we change ourself. I don't have all the answers because I'm no where near where I want to be, but I'm going to share three steps we can take to get on the road and stay on the road to change. First, we can't do it ourselves. It's impossible. I'm a Christ-follower. Jesus is the light of my life and without Him and His strength I couldn't begin to stay motivated on this path to life change. I physically have to make myself spend time in prayer and Bible study. I have to make myself become more like the principles outlined in His Word. And I have to abide in my relationship with Him. He is my source. Maybe you're not a Christ follower, but you still want to see change and impact change in your community. I believe that God will still help you in your path. Ask for help and see what He can do in you and through you. And even if asking God for help isn't a possibility, seek help from another like-minded individual...someone who wants to change their community. Hold each other accountable. This is a journey, after all. And journeys are much more fun with other people. Second, we have to be inspired and stay inspired. As of late my life has been a little crazy, but who's life isn't? Busy-ness may be the greatest adversity you'll face on the road to life change. We're too busy to work on ourselves. But that has to change. A couple of months ago I decided I was going to really commit myself to voice training. I'm a good vocalist. I was a voice major in college. I've always known that singing is a talent of mine. What most people don't realize is that even excellent performers and musicians have to practice. I committed to practicing and to developing that gift even more extensively. I downloaded my books and music, I downloaded podcasts, and I started rehearsing. And then life happened. My life was interrupted and I found myself traveling most weekends. My week nights were full with life's weekend activities. It has just been crazy. But here's the thing, my crazy life is no excuse for not staying inspired. I know what I'm supposed to do. I just haven't done it in a couple of weeks. Right now I feel a little shame because of my lack of commitment. Which brings me to my third point. In order to see true life change, we have to be committed at all cost. I love passionate people. I love passionate people who can talk for hours about what drives them in life, but what I love more than passionate people is a passionate person that will not give up regardless of the obstacles they face. That's the kind of person I want to be. I want to be a person who is passionate about seeing the world changed for the better. I want to be so committed to my mission that I will fight relentlessly to make the world a better place. 1. Surround yourself with people who will help you meet your goal. 2. Get inspired and stay inspired. 3. Be committed at all cost. If I'm going to be that kind of a person it all starts with change. 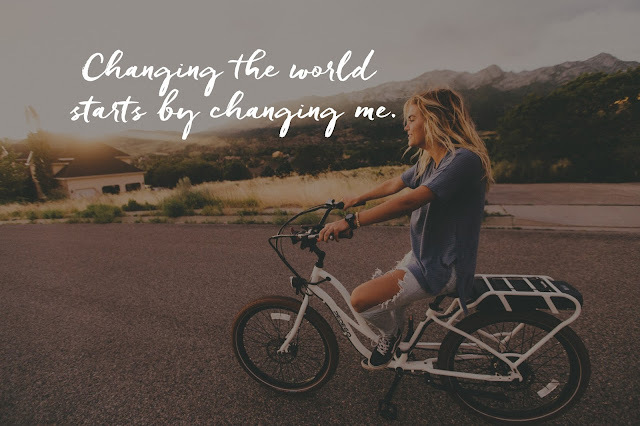 Changing the world around me starts with changing me.